Lyndon Johnson was the 36th President of the United States of America, the symbolic leader of the country. His presidency began in 1963 and ended in 1969. He was 55 years old when he first began his term of office on November 22, 1963. Lyndon Baines Johnson. He was given his first name after a family friend and lawyer 'W.C. Linden'. His mother changed the spelling from Lindon to Lyndon. Baines was his mother’s maiden name. His famous nickname was LBJ. The Light-Bulb Lyndon nickname was because he hated wasting electricity, and went around the White House in a bad temper turning off unnecessary lights. 'Landslide Johnson' was due to the rumor that the voting was rigged when he was elected Democratic candidate for the Senate. The picture of Lyndon Johnson portrays an interesting image of what this famous man looked like. The picture shows the clothing and the hairstyle that was fashionable during his presidency. He is described as being 6 feet 3 inches in height and 200 pounds in weight. He had brown colored eyes and his hair was black that turned gray with age. LBJ was an attractive man in his youth with a strong cleft chin. His faced was carved with deep lines as he grew older. He was short sighted and required reading spectacles. Aware of his public image who also dressed smartly in expensive, fashionable clothes. 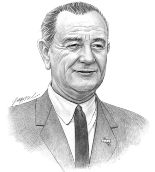 Character and Personality Traits: What was Lyndon Johnson like? The personality of Lyndon Johnson is described as a forceful, competitive man, highly ambitious, stubborn and intent on getting his own way. LBJ was a multi-faceted individual and one described as being "...as gentle and solicitous as a nurse, but as ruthless and deceptive as a riverboat gambler". He enjoyed the power and influence that was afforded to him as President of the United States. The important role and duties of the President of the United States of America include those of Chief of State, Chief Diplomat, Chief Executive, Commander in Chief, Legislative Leader and Leader of his own political party. What was Lyndon Johnson famous for? Why was Lyndon Johnson important? The history and life of President Lyndon Johnson during his presidency is conveyed in the following fact file in an easy question and answer format. What President was Lyndon Johnson? He was the 36th President of the United States of America. The dates of his presidency began in 1963 and ended in 1969 (November 22, 1963 to January 20, 1969). What other political offices did Lyndon Johnson hold before his presidency? What was Lyndon Johnson' nickname? His most famous nickname was "LBJ"
Who was Lyndon Johnson' s first lady? Lyndon Johnson was famous for the events and accomplishments of his presidency, but what are the facts about the man and his private life. Facts and information about the private life of Lyndon Johnson can be found in the following fact file in an easy question and answer format. When and where was Lyndon Johnson born? The name of his father was Sam Ealy Johnson, Jr.
Where was Lyndon Johnson educated and what was his religion? What did Lyndon Johnson do before he became President of the United States? Who was Lyndon Johnson' wife and when did they marry? Did they have kids? When did Lyndon Johnson die? We hope that the picture, facts and information on President Lyndon Johnson will prove helpful to kids, school children and schools learning about the presidency of this famous American leader. The facts about Lyndon Johnson provides an overview of the President's character and personality traits. Watch the video and learn more about the major events of his life and his accomplishments. The following Lyndon Johnson video is a useful educational resource for kids, children and schools learning about the life of the US President Lyndon Johnson.